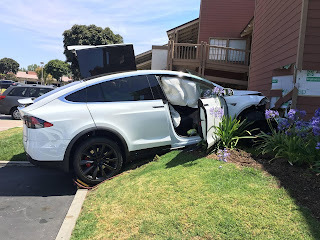 A 5 day old Model X was involved in a serious car crash yesterday in Irvine, California. 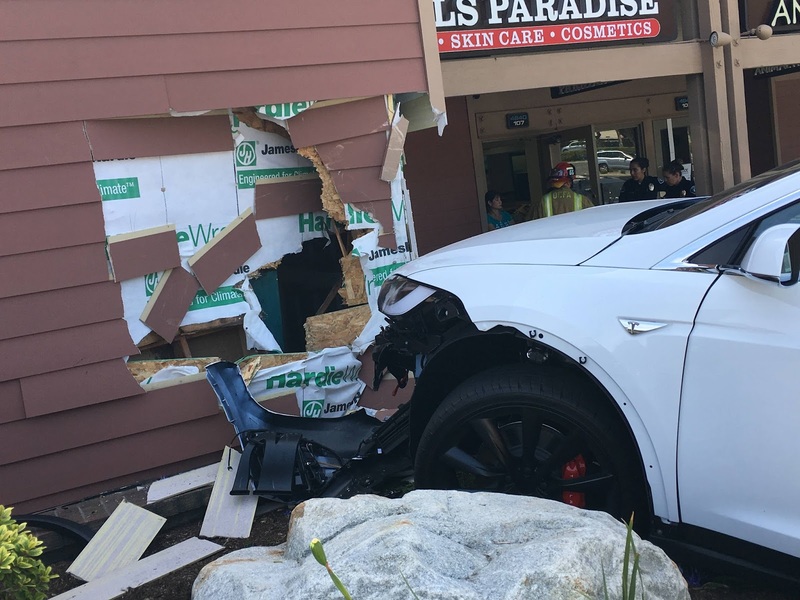 According to the owner, Puzant Ozbag, the SUV was entering a parking stall at no more than 5 mph when the car "suddenly and unexpectedly accelerated at high speed on its own, climbing over 39 feet of planters and crashing into a building." Consequently, the airbags were deployed and caused burn marks on his wife's arms. The owner continued "the acceleration was uncontrollable, seemed maximum and the car only stopped because it hit and caused massive damage to the building." 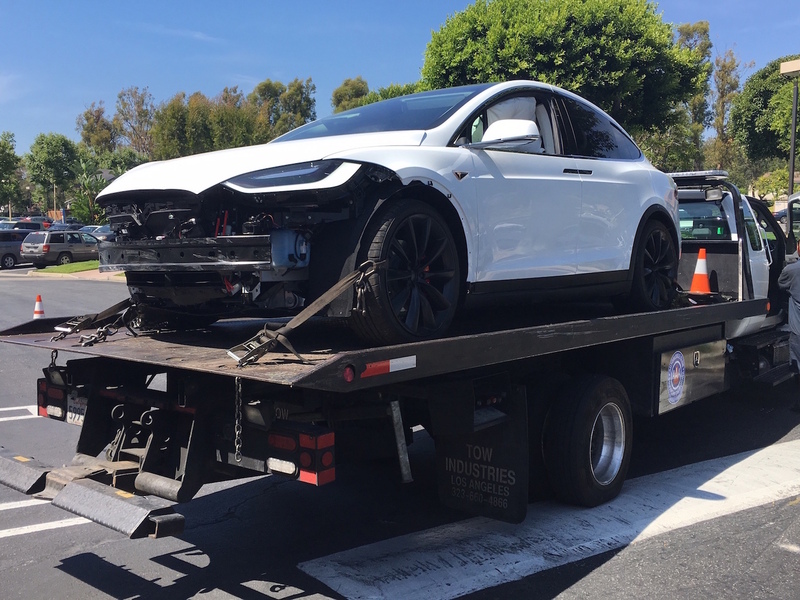 The owner is requesting Tesla to stop deliveries of the Model X and investigate the cause of the accident before further drivers are involved in similar situations. "This could have easily been a fatal accident if the car's wheels were not turned slightly to the left. If they were straight, it would have gone over the planters and crashed into the store in front of the parking stall and injured or killed the patrons" suspecting a software glitch or a computer malfunction was at fault. 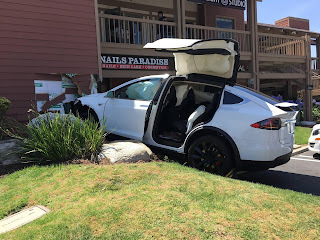 According to the owner, Tesla's roadside assistance asked the owners to tow the car to AAA storage facility and informed them that a representative will contact them shortly. However he has not heard back from them. 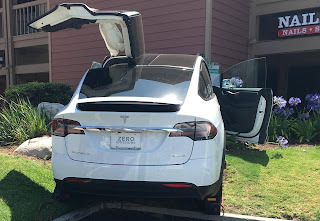 It is not yet clear what caused the accident and we hope Tesla will be able to shed more light on it. This is possibly the first Model X involved in a serious accident. Recently a Model S has been involved in an accident where Autopilot was in question. Please note, this is a news website dedicated to everything Tesla, we are not singling out Tesla vehicles, we just happen to report accidents involving Tesla vehicles and will report any updates in case Tesla representatives come back with details on the accident after checking the car's data logs. UPDATE: A Tesla spokesperson sent the following statement to electrek.co after reviewing the vehicle’s logs. It appears human error was at fault. Unfortunately it is easy for drivers to lay the blame on the car's instruments when they forget to follow the proper procedures when driving. 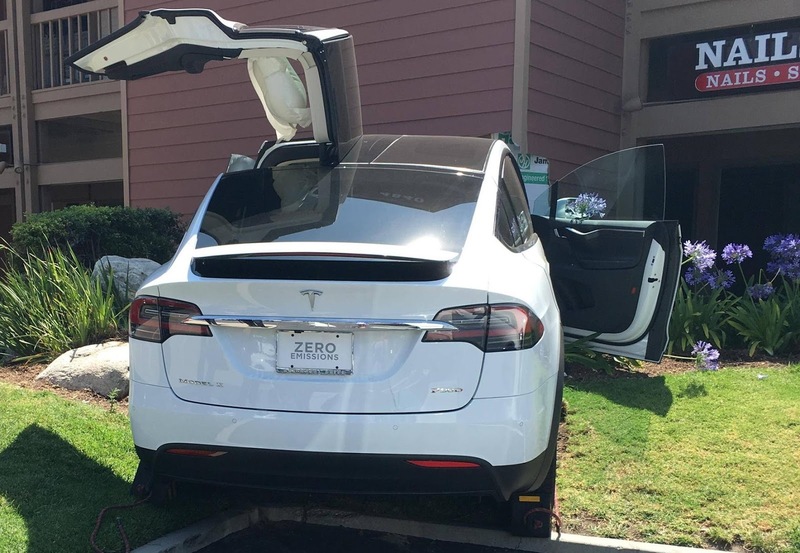 "We analyzed the vehicle logs which confirm that this Model X was operating correctly under manual control and was never in Autopilot or cruise control at the time of the incident or in the minutes before. Data shows that the vehicle was traveling at 6 mph when the accelerator pedal was abruptly increased to 100%. Consistent with the driver’s actions, the vehicle applied torque and accelerated as instructed. Safety is the top priority at Tesla and we engineer and build our cars with this foremost in mind. We are pleased that the driver is ok and ask our customers to exercise safe behavior when using our vehicles." Featured images: Tesla Motors Forum. No doubt Tesla is going through the data and trying to figure out what happened. The owner is a joke for trying to tell Tesla what to do. Maybe he was using The cruise control handle that caused The car to accelerate back to The speed he had before The parking area. I guess The fault was caused by the driver.
" I just got my new TESLA and forgot to clean the glass in my belly button" the driver was heard saying after reading the data from the onboard diagnostics after the crash. Tesla is a reputable automobile manufacturer and is very serious when it comes to quality assurance and safety. Personally, I think the driver mistakenly stepped on the accelerator instead of the brake. Don't be so quick on blaming the company. Their integrity is at stake here. This update is awesome and I take pleasure reading about this kind of update. Popular information like travel, friends, car financing, home renovation and even online shopping are unfailingly advantageous and I definitely recommend checking out this type of updates. Thank you for the information!